It had been almost a year…A YEAR!…since Gary and I were with our family! We were like a couple of kids waiting for Christmas morning as we counted down the days ’til we would board our flight from Seattle to Oklahoma City…and finally BE.WITH.OUR.FAMILY.AGAIN! OUR FAMILY! It’s not a BIG family, but it’s OUR FAMILY! Rex (our oldest) and his wife, Lanie, have a son and daughter; Luke (our youngest) and his wife, Angela, have four girls. We rented a cabin in Medicine Park, Oklahoma and ALL TWELVE of us were under the same roof. We gathered together to celebrate a Thanksgiving/Christmas; it was during Thanksgiving week. Although some of the Barrett clan would have liked some snow, Gary and I thoroughly enjoyed the 60-70 weather. But mostly we, ALL TWELVE of us, enjoyed being together. FINALLY! Then I began to wonder about my Abba Father. I wonder if He is excited and looking forward to the day when all His Family will be together? Christmas gives us the answer! YES! Abba Father is looking forward to THAT day. He gave His one and only Son to make it possible for us to be His Children! I can sense Father God’s excitement––FINALLY! PAH! Look at the words Father God uses: HOME. LIVE WITH THEM. GONE FOREVER ARE DEATH, SORROW, CRYING, PAIN. EVERYTHING NEW! GOD WITH HIS CHILDREN! HOME! The Son of God has made me a child of God. And if you have received Jesus and believe in His Name then The Son of God has made you a child of God. That is BIG GOOD NEWS! Let us pause right here. Let us stop and think about this amazing truth. Let us be still for a few minutes and reflect on what this means. **The cost God paid in giving His one and only Son making it possible for us to receive the free gift of eternal life. **The depth of God’s love in the incarnation to bridge the gap from heaven to earth so that when we die and leave earth we can go to heaven. **That God reached out to us and became flesh––the Holy Child in all of our human-ness––so that we could be transformed wholly into the image of God. Holy Spirit I pray the truth of CHRISTMAS overwhelm our hearts and lead us to worship Jesus with all our being! Until I see my family again, I will do what I do each morning. I will pray for them. Friends, our loved ones need our prayers now more than ever and praying God’s Word over our loved ones is a powerful way to pray. 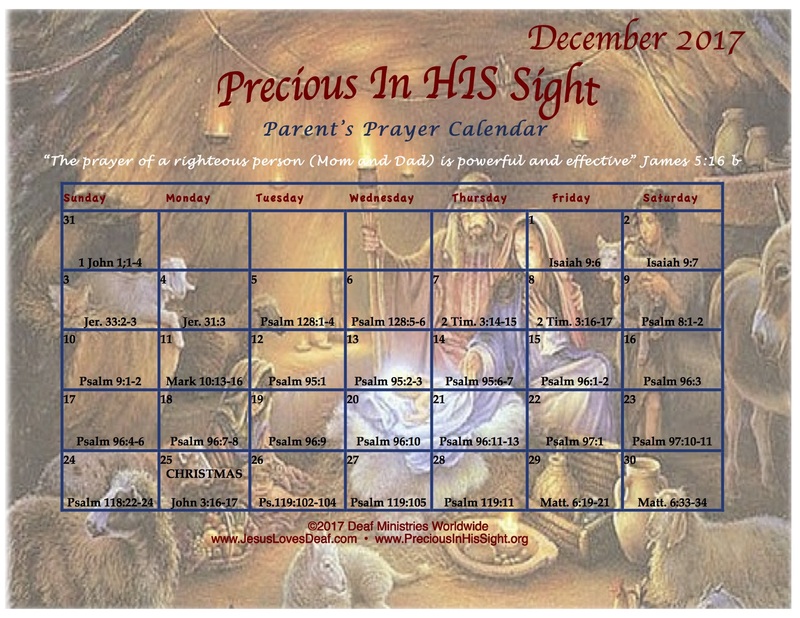 The Precious in HIS Sight Prayer Calendar has helped me faithfully pray for my loved ones day-after-day and year-after-year. I print my Calendar and keep it with my Bible. I look up the scripture verse for the day and turn it into a prayer. Click on the Calendar and it opens enlarged in a new window so that you can read the scripture references easily. I encourage you to print the Calendar, too. Join me as we pray for our loved ones…our Abba Father is listening. This is a beautiful promise in James 5:16b, “The prayer of a righteous person (dad/mom, papa/grandma) is powerful and effective.” That’s a WOW verse! COME LET US ADORE HIM…DAILY.